I'd like to invite you all to listen to a six-minute pro-nuclear shill speak on public radio without anyone presented on the same segment to counterbalance his lies, and then I hope you'll join in the conversation at WBUR, Boston's public radio station, where "Here and Now," the show that featured the pro-nuke shill, is produced. >did not have an oppositional view represented on the program. Below are some of the comments I've left at WBUR. I think it's a very important place to air your views. I'm sure many very influential people pay attention to the show, as well as a large intellectual community in the area and around the country. Please let WBUR know they should provide far more balanced reporting, and please help balance their report with your own comments! The tsunami and earthquake "crippled" the Fukushima power plant? That's really all you think happened? Not just "crippled", melted down and spread poisons all over the globe. Not safe, and not reliable. The root cause of the accident wasn't just poor planning, it was utilities being cheap in the face of obvious dangers the industry was warned about decades ago. That's not poor planning, it's criminal negligence -- and 22 reactors in America are being operated by negligent utilities, even four years after the tragedy. Why not get one of the guys that warned the industry about the dangers of GE reactors on your show, instead of the shill from the industry? And why did you let him get away with not answering your questions? Worse yet, why did you lead him on when he couldn't give a good answer? Why did you let him lie on public radio? Nobody on earth is making "good progress" on the problem of nuclear waste. Some countries are pressing forward anyway, that's all. So, Rod Adams responds that American reactor operators would have vented: "Vent and vent often." This "venting" you speak of is a vile, grossly polluting last resort that should never have to happen anywhere. [Rod later claimed you can drink condensed primary coolant (I'm sure he at least wanted to wait for the N14 to decay, a matter of minutes!)] But aside from that, the events at Onagawa and Daini were not the same as at Fukushima... and perhaps you've forgotten (since all nuclear enthusiasts have a short memory for nuclear near-catastrophes) how close Japan's 7-reactor site came to a meltdown a few years back? Japan was warned about "genpatsu-shinsai" decades before Fukushima, but nuclear power plant operators are in it to make money, they can't solve the waste problem and they can't operate efficiently and safely at the same time. Maintenance at San Onofre was already on a "fix on fail" schedule when its (nearly new) steam generators sprang a leak; the whole plant was falling apart (as pictures in the newspapers showed, with rusting-out main pipes, and leaks fixed with plastic bags and broomsticks). Japan's renewable energy plans include underwater turbines, wind turbines, solar rooftops, geothermal power and a whole lot of things no nuclear backer could love. Had they embarked on a clean energy plan back when America was pushing nuclear power down their throats after WWII, they wouldn't have a quarter of a million displaced nuclear victims right now. The U.S. Government has never released figures for the long-term health consequences of nuclear submarine and carrier work... but oh, the stories we old-timers in the nuclear "biz" have heard, Rod! Look around for your old shipmates and see what they died of: Brain cancers, lymphomas, heart problems, inflammation... look at their kids, the deformities, the childhood leukemias, the underdeveloped brain function.. look at their wives... who simply lived in close proximity to them. Do a SCIENTIFIC study, not one based on hearsay... because the hearsay is pretty damning... demand the government collect and release figures for our nuclear sailors, especially those on board the CVN Ronnie Raygun... and ask why in God's name such studies haven't been done? 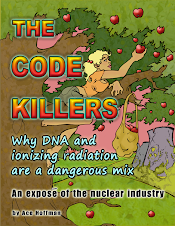 We STILL rely on the faulty and biased RERF research for estimates of radiation danger. Could be 100 times worse than estimated and no one would notice, but even doubling the danger would wipe out the nuclear industry. Recently it was determined that the large earthquake (8.0+) risk for California is significantly higher than previously estimated -- above 7% based on studying the behavior of about 250,000 earthquake faults, instead of the old figure, based on studying a few hundred earthquakes, in the 4.5% range. This spells doom for Diablo Canyon, either we shut it down or mother nature does. You old pronukers can't stop progress and realization, Rod. The public has been warned to keep away from nuclear power. Chernobyl warned us. Fukushima warned us. Three Mile Island warned us, and Al Queda even warned us. Don't keep pushing nuclear power just to keep the lights on -- it's just not needed anymore. A complete switch to LED lighting alone can save more energy in America than nuclear power produces. So could a partial switch to solar rooftops, or a modicum of wind turbines -- a few hundred would be enough to replace Diablo Canyon. We are half-way done with closing nuclear power in California, Rod, and for all the right reasons. It's just too damned risky and its proponents can't see the forest for the cemented-over islands in the pacific that were bombed in useless "weapons testing" and whose lethal plutonium will surely start to leak out as the sea levels rise. There are more than a dozen nuclear reactors on the seabed: Thresher, Scorpion, Kursk and many others. And don't say it wasn't the reactor's fault, because A) you don't know that, and B) it doesn't matter. Nuclear power plants are all just accidents waiting to happen. If not to the plant itself, then to the waste pile that mustn't get out yet somehow does, and will, again and again and again for thousands of years. That's a pretty deadly gas! Polonium killed Alexander Litvinenko in microscopic quantities, it and plutonium has been delivered to countless tens of thousands of beagles and other animals in gas form: plutonium kills humans in quantities around a few millionths of a gram. All the above-mentioned radionuclides (and many others) do. So those are pretty deadly gasses. The industry is required to dilute them massively before release, and often doesn't have to measure the release until it gets past the site boundary, when it's already been diluted significantly. And then they don't have to tell the public for at least a year and sometimes forever. "Recycle" means create fission products (some have very long half-lives, I call them the "ignoble seven"). It means risk more meltdowns. It means pollute terribly, the place where the reprocessing is done (if past experience is anything to go on...). And the thing about renewables people arguing about which renewable energy system is best: They're all good. Can't say that about nukes. And spent fuel is not "well-behaved." It eats away at its containment from the zirconium cladding on out, with gamma rays (which break down anything including our DNA) and even just with pressure from the helium buildup as the alpha particles escape We're talking about safe storage for tens of thousands of years, or -- with your "reusing" plan, at least for tens of thousands of storage casks (there is enough fuel for >10,000 casks already in America, with about 2,500 casks already in use), each with enough inventory to wipe out a state, each stored for many decades, scattered all over America, at dozens of different sites. That's a lot of rust spots that can develop from the outside, or weld joints that can fail from the inside, or criticality events that can happen from airplane strikes by terrorists causing the cladding to fail and the fuel to pool at the bottom of the dry cask, since most assemblies are "un-canned." I suppose this "debate" may go on for a while. Since pronukers invariably make their living from nuclear power (or did, all their working lives), they'll keep at it until the end, until every nuclear power plant is closed, and beyond. So the more of us that chip in, the better!